Hellenic Immortal is the second book in Gene Doucette's Immortal series. We pick up a couple of years after the end of Immortal, but Adam is back on his own and in Las Vegas. We do get a closure on what happened/is going on with Iza (the pixie) and Clara (the girl). If you were hoping for more adventures with this trio, well you are out of luck. Except for a few passing references, we get a whole new cast of characters. I really wanted to like this book. However, the entire time I was reading it, something felt off. I think in part is the new cast of characters who I did not connect with. I had a hard time getting into the entire story. There was a mystery to be solved in Immortal, I didn't feel there was much of a mystery in this one. The whole tone of the book seemed off to me. 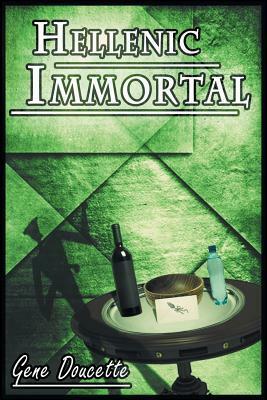 In my review (see it here) of Immortal, I praised the writing style. Whereas it was sharp in the first book, it seemed dull in the sequel. I know that Gene went with a new publisher for the second book which means a new editing team, but I don't think it was necessarily editorial problems. Adam's voice was different. Greek mythology has never really been my thing so I'm sure that didn't help when reading Hellenic Immortal. I did find the history a little more interesting this go-around. I'm not sure about the new creature he introduced. In general, satyrs are okay, but did we need a "creature"? Could the story occur even if they were human? I had really high hopes after reading Immortal and I'm sure that played some into my disappointment. That is how it can be with sequels. Was it a good story? Yes. Did I find it entertaining? Yes. Was it what I was expecting? No. I really wanted more of Clara and Iza. I liked those characters and connecting with characters is high on whether or not I really like a book. I could not connect with Mike or Adriane. And I'm not sure if I really like Adam. I was happy to get more information on who the red headed woman is. So should you read Hellenic Immortal? I think so. It had entertainment value and I'm glad for the glimpses we got of Clara and Iza. Your turn: How do you feel about sequels? Does the anticipation enhance or hinder your enjoyment? Hm. I just read tr two back-to-back, and if anything I liked the Hellenic Immortal quite a bit better. I didn't particularly care about Clara one way or the other, and I think them going their separate easy for awhile makes a lot more sense narratively than becoming an immortal, mystery-solving duo. I expect we'll see her in a subsequent book, and her appearance will be more interesting for having been doing her own thing for awhile. I think for me it was the combination of not really liking Greek mythology, high expectations, and having to learn about a new cast. When there is a whole new cast I often find myself not liking it as much. For example, I loved the television show House until they changed all the characters. Then I quickly grew bored with the show. I can see that. For me, Adam is the main interest and everyone else is secondary. I can also see not getting into the Greek thing, though for me, that was part of what I enjoyed. Wherea with the first book the historical asides wre pretty random and often tangential to the story I thought here they were more focused and helped drive the story.